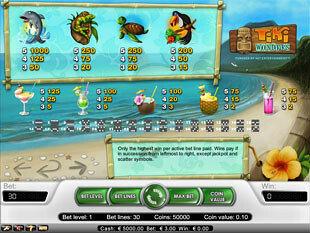 Tiki Wonders Slots is a bright sandy beaches to forget about rainy weekends, noisy streets and creepy neighbours. 5 reel 30 paylines of happiness and relaxation presented by NetEnt. Have a walk along golden sea sipping pine-apple cocktail and making a wish every time wave touches your feet. Relax and try to win the top jackpot of 10,000 coins to make your holiday even more perfect. 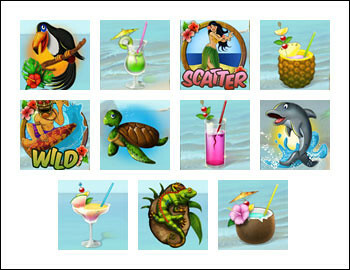 Free Spins, multipliers and progressive jackpots are the other treats of this paradise. Enjoy welcoming calm ocean in no download format when no extra software is installed into your computer. Feel touch of golden sun on your face, dive into the deep blue ocean and enjoy the calm music transferring you into the harmonious world of happiness. Such symbols as Surfer, Dancing Girl, Toucan, Lizard, Turtle, Dolphin and plenty of Cocktails for any taste make your holiday unforgettable. To buy a ticket and fly away to your dreamland you need to choose such coin sizes as $0.01, $0.02, $0.05, $0.10, $0.20, $0.50. Play with 30 paylines choosing penny coin size. Thus, you will spend just $0.30 per spin with quite decent chances to win. If risk is in your blood, you can choose the maximum option when you play with 4 coins per line and the maximum coin size of $0.50. The total bet in this case will be 120 coins or $60. Just enjoy rough storms of wildness when everything is at stake. The highest wonder jackpot is 10,000 coins or $20,000 for 5 Surfers. The second wonder jackpot is 2,000 coins or $4,000 for 4 Surfers. The third highest wonder jackpot is 1,000 coins or $2,000 for 5 Dolphins. Cleaving crystal water Surfer is the wild symbol. He is happy and powerful enough to substitute for any other symbols. The only exception is the scatter symbol. Enjoy rough waves to catch all the prizes on the reels. Pretty Dancing Girl is the scatter symbol. 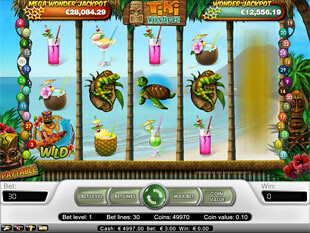 She invites you into the paradise with 2, 4, 50 or 400 times multipliers presented. The scatter prizes presented by this beauty are multiplied by your total bet staked. Thus, the higher is your bet, the better prizes you will get. In other words, play with the highest $60 total bet and win $24,000. Free Spins. Feel gentle breeze soothing you skin and touch miracle of harmony with 30 Free Spins. This is the maximum amount you can win. The number of Free Spins depends on the Dancing Girls you meet on the reels. If you three Girls you will have 10 Free Spins, if four – 20 Free Spins, if five – 30 Free Spins. Anyway, you will triple your prizes during this bonus feature. Triple your pleasure as well with the maximum prize of 30,000 coins or $60,000 per spin. Mega Wonder and just Wonder progressive jackpots wait for you. Catch stars on the reels to win really impressive award. Four stars to win Wonder progressive jackpot and five stars to catch Mega Wonder prize. You also should play with the maximum bets to get more chances to win. Tiki Wonders slot machine makes you enjoy this wonderful wonderful world with aquamarine oceans and blood-rushing cocktails. Quit your boring existence to dive into the ice-creamy vanilla paradise with pink clouds and pretty prizes.